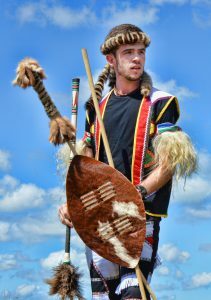 David Jenkins, also known as Qadasi, is an accomplished Maskandi musician who developed a deep passion for Zulu culture and music at a young age growing up in Empangeni, right in the heart of Zululand. Now based in Durban, KwaZulu Natal, David is following his dream of being a professional Maskandi musician and is proud to be a SAMA (South African Music Award) and two-time SATMA (South African Traditional Music Achievement) Award nominee. With two solo albums and a new collaborative release featuring fellow Maskandi artist, Maqhinga Radebe, Qadasi’s quest to revive traditional Zulu Maskandi music is well underway. Over the past several years, Qadasi has accomplished a great deal as a South African artist, with some of his achievements including performances in the USA, UK, Ireland and Asia, and a performance at the 2015 SAMA Awards live show. Qadasi is presently under the independent label, Sande Entertainment, headed by Sibongiseni Shabalala, a member of four-time Grammy Award winning group, Ladysmith Black Mambazo. His last solo album, Uhambo Olusha, is the end result of the sounds Qadasi has been developing over the years and was nominated for Best Maskandi Album in the 2014 SATMA Awards and Best Traditional Album in the 2015 SAMA Awards. It encapsulates influences from many of his idols, ranging from the likes of Phuzekhemisi and Mfaz’ Omnyama to Johnny Clegg and Paul Simon. In early 2016, Qadasi went on to record a collaborative album alongside friend and mentor, Maqhinga Radebe, titled, “Lashis’ Ilanga” – an organic, acoustic fusion of traditional Maskandi and western folk music. This was nominated for a 2017 SAMA Award for Best Traditional Album. Aside from promoting Zulu culture, traditional music and social cohesion, Qadasi and Maqhinga have both been actively involved in rhino conservation, working alongside the Kingsley Holgate Foundation and Project Rhino KZN as Rhino Art Ambassadors. There is much excitement in the promise of what lies ahead for this Maskandi artist who is continuing in the footsteps of this powerful genre’s icons. 2015 – Performance at the SAMA Awards Live show. 2015 – KZN Young Achievers Award for Social Cohesion through Maskandi Music. 2015 – Performance with Maqhinga at the ‘Take a Walk on the Wild Side’ South African Ball in Bangkok, Thailand. 2015 – Performance with Maqhinga at the Bear Grylls Survival Race Festival in London, United Kingdom. 2016 – Performances with Maqhinga for SA Embassies in Vietnam & Thailand and SA Consulate in India as part of SA Freedom Day celebrations. 2017 – Lashis’ Ilanga nominated for South African Traditional Music Award (SATMA) for Best Male Group. 2017 – Invited to perform at the annual Ferrara Buskers Festival in Italy.